« Day 207 in Beijing: I’m a Little Weird. Day 208 in Beijing: The Petronas Twin Towers. We have towers growing out of our heads! Petronas is the national oil and gas company in Malaysia. 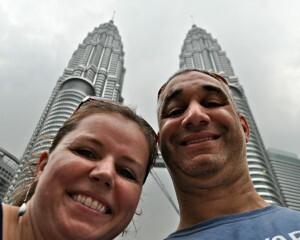 Most people don’t know this but they do know that they have two huge towers in Malaysia. 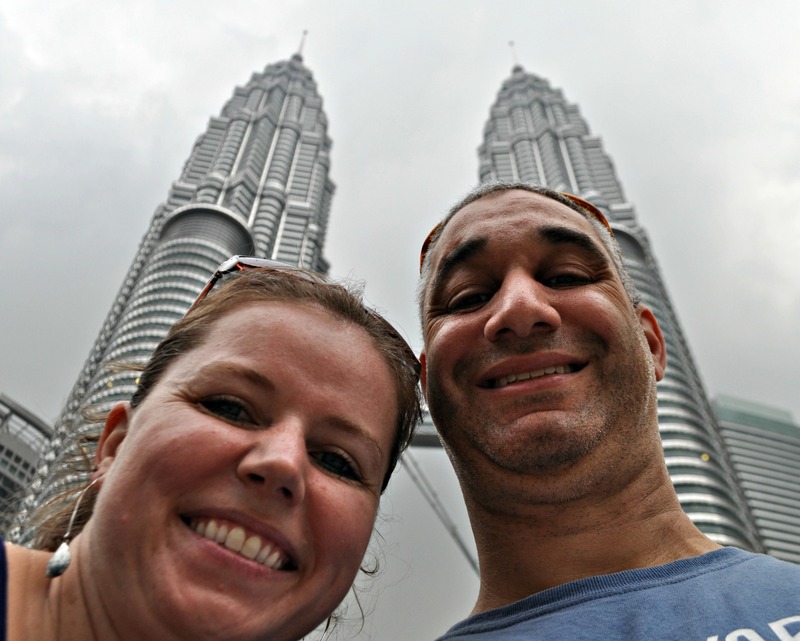 These are the Petronas Twin Towers and they are impressive. They were the tallest buildings in the world until 2004 and continue to be the tallest twin buildings in the world. Jill and I visited them a few days ago and they left an impression on us of the upcoming changes and economic powerhouse that Malaysia plans to be in the near future. Their economy is booming and the cost of land is rising. They are going to have high speed rail from Kuala Lumpur to Johor Bahru, which leads to Singapore in the next few years. They are planning to have a free trade zone with Indonesia, Singapore and Johor Bahru so that there can be more trade and people can move across borders more easily. To give you an idea of the border issues, every time we went from Johor Bahru, which is about a 3 minute bridge ride, to Singapore, we had to have our passports stamped on each side. This means 4 stops at customs per day for people commuting from one side to the other. Great if you want to load up your passport and look like a world traveler, terrible if you want to get to work on time. There are also major theme parks, gorgeous jungle retreats and amazing beaches all over this island. Of course, this is not all good as a rising tide does not lift all boats. There are people here that are getting left behind. Hopefully it won’t be overwhelming and things will work out for the best. I haven’t even mentioned the different cultures and customs which draws us to this country. That is one of the reasons we’ve been here twice in 3 months. The other reason is the people. The Malaysian people are some of the kindest people we have ever met. There are only two other people that I’ve met that seem to be as kind and one is a cultural reason and the other is for a reason that horrific. The first are the Balinese people. They are just friendly, humorous and kind. I stayed there when I returned from Japan, and teaching English with the JET program, in 1997. I felt these were the kindest people on the Earth. They just might be. The second were the Japanese people of Hiroshima. I visited there when I was living in Japan and was amazed at the kindness and humility of the people who lived there. I believe they saw the worst humanity can do and decided that they never want to have that kind of hate, and destruction, in their lives again. I feel that The Petronas Twin Towers show the strength, power and drive of the Malaysian people and their determination to move their country towards a changing future. I hope that the people continue to be who they are, even when economic tides change, and their incredible culture continues to thrive through it all.